I am in an incredibly good mood today! More on that in a bit! 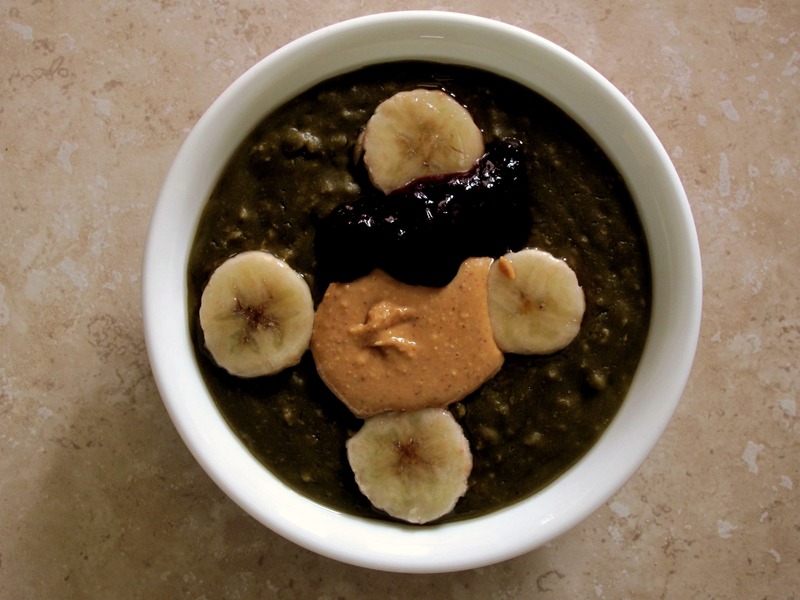 I started the day off right with this ugly swamp bowl of oatmeal! Why the swampy color? Well I blended the liquid with spinach before cooking the oatmeal in it. Yum, even mom liked her bowl! And yes, that’s homemade peanut butter, blackberry preserves and frozen banana slices on top. Rewind! 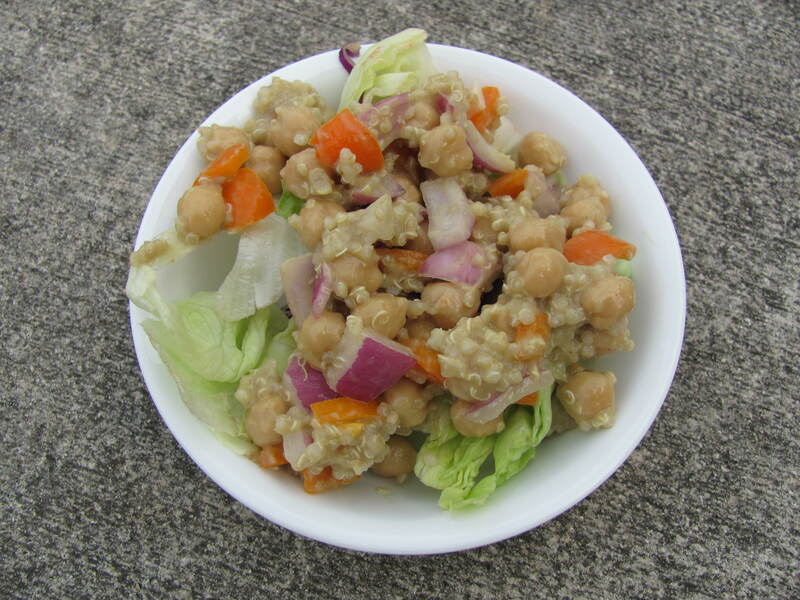 Last night for dinner I made a spin-off of Angela’s recipe for Tahini Avocado Chickpea Salad. I didn’t have tahini, so I used a TBSP of peanut butter but other than that, I followed the recipe pretty close! It was soo good, I love this chickpea salad! I had leftovers for lunch today! I also had some lonely cornmeal sitting in the pantry so last night I whipped up a half-batch of cornbread. As I was Googling recipes, I realized, much to my dismay, we were out of eggs! How could I make cornbread without eggs? Then I remembered that you can ALWAYS find a vegan recipe! They were splendid! 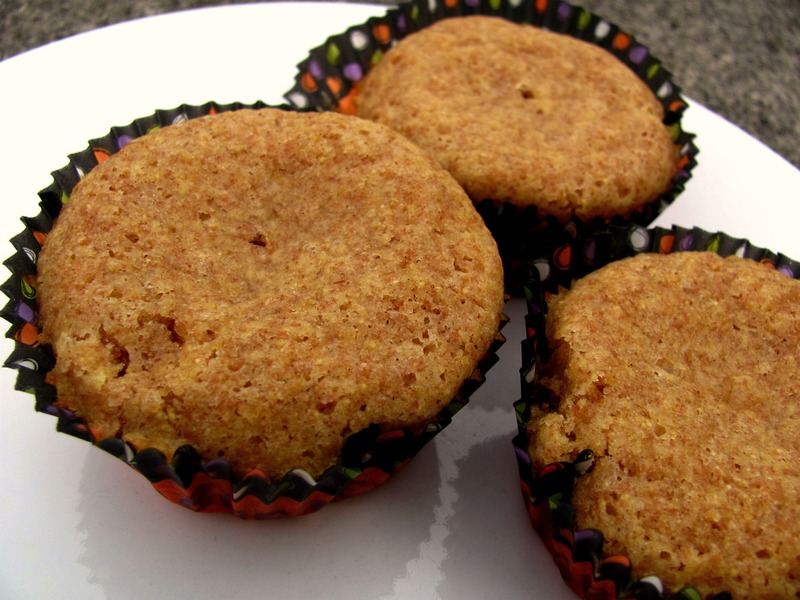 I found this egg-free recipe and made them into muffins, so amazing and tasty and soft. Even my pickiest brothers liked them! Tomorrow I am going to Whole Foods for the first time! I am BEYOND excited! My mom is making me spend my own money so that I’m more careful about what I buy! I’m always more conscious about what I’m buying if it’s my own money. So yeah, I can’t wait and I’ll be sure to update y’all on all the goodies I get! What’s your favorite item at Whole Foods or another health food store? Do tell! WOW great list for WF!! YAY for happiness!!!!!!!!!!! i always get grains, pb, wraps, tofu, vegan choc chips, and my vegan vitamin supplements! Have fun at Whole Foods! Sometimes I wish I didn’t live so close to one- I spend too much money there! tahini, sunflower seed butter and unsweetened chocolate are all sold at typical supermarkets like Walmart or Meijer. That’s where I get mine! they sell them at whole foods, too, but they’re much cheaper at other stores. they also *MIGHT* sell carob chips at meijer/walmart. One of my local meijers sells them, the other doesn’t. buy the oat bran and pumpkin seeds in bulk. they’re suprisingly cheap that way. Thank-you Alexandra for the helpful hints! You’re right, there is unsweetened chocolate at Walmart but I haven’t seen tahini or sunflower seed butter, but maybe I’m not looking hard enough..? We don’t have a Meijer, so I don’t know! And I also haven’t seen carob chips. But yay for oatbran and pumpkin seeds! I love whole grain pancake mixes. Although I make my pancakes normally from scratch there are just times-I don’t have time and the mixes are perfecto. Hope you have an awesome time at Whole Foods!!! 😀 I loved it when I went! I LOVE Whole Foods! We only have a few in the UK, and they’re all in London (good job I live there)! I rarely get to go though, but I went last week and LOVED IT! I’ve actually never bought anything at Whole Foods before except for veggie chips cause it was the first time ever seeing them. But I’ll usually just spend hours wandering around and gawking cause the stuff’s way too expensive for me to feel ok about buying. Your oatmeal bowl looks so yummy! I need to get some more cinnamon raisin PB from Whole Foods! Craving it so badly! If I were you, I would skip the things that you could get some where else for cheaper, like the pumpkin seeds, oat bran, and chocolate. Even though my parents pay for the groceries I buy, I still buy things within reason. I’d feel bad if I came home with like 5 jars of Justin’s almond butter! My favorite products exclusive to whole foods are the seeduction bread, senate white bean soup (prepared foods section), and the whole foods roasted vegetable tomato sauce. I recommend taking advantage of the bulk bins and hitting up the hot bar. I think I had a sample of the seeduction bread today, it was really good!! Sometimes ugly oats taste the best, and I’m sure yours didn’t disappoint. 🙂 I love your whole foods list. I really should make a list before going to the health food store- I always spend soo much time there browsing the aisles. My favorite products would have to be the nut butters. I love trying out new ones (or just replenishing my empty jars). You’re going to LOVE it there. I shop there weekly but, I don’t get all my groceries from there. The things I buy there are organic fruits & vegetables, nut butters, sprouted breads and grains! Wow that oatmeal is a scary colour! If it tasted good though thats all that matters isnt it hehe! We dont have anything really like a wholefoods in the UK 😦 all our good “supermarkets” like that are only tiny little specialist stores, so irritating!! SO jealous. I’ve still never been to Whole Foods!! I definitely want to try Barney Butter except it’s so darn expensive. Yeah, I didn’t get any because it was so expensive. It’s just like NO I am NOT paying that ridiculous price for almond butter!